With small children in the home, little handprints seem to end up everywhere — sometimes in a rainbow of colors! They’re on the freshly cleaned glass and the newly painted walls. Let’s not forget the sticky imprints on the couches! As frustrating as it may be to clean up the mess, I know the day will come when I’ll miss wiping those little smudges off the refrigerator. In fact, most times I just chuckle and shake my head when I find a gooey smudge in a place it doesn’t belong. The little hands that left them behind are already growing way too fast. Are you looking for a fun way to preserve those little handprints and even put them on display? This is truly one of those sentimental, mush-gushy craft projects that moms and kids do together! And if this easy silhouette craft puts the “Silhouette itch” in your crafting mom soul, then definitely consider making these Butterfly Silhouettes after! How does these easy craft bring parent and child together through art? Through special moments that can only be expressed through crafting together. And finally framing the finished masterpiece. Those moments create memories, and those memories create close-knit relationships! Then, ten years from now, you and your child can look back on those little hands and remember that special time of creating something beautiful! 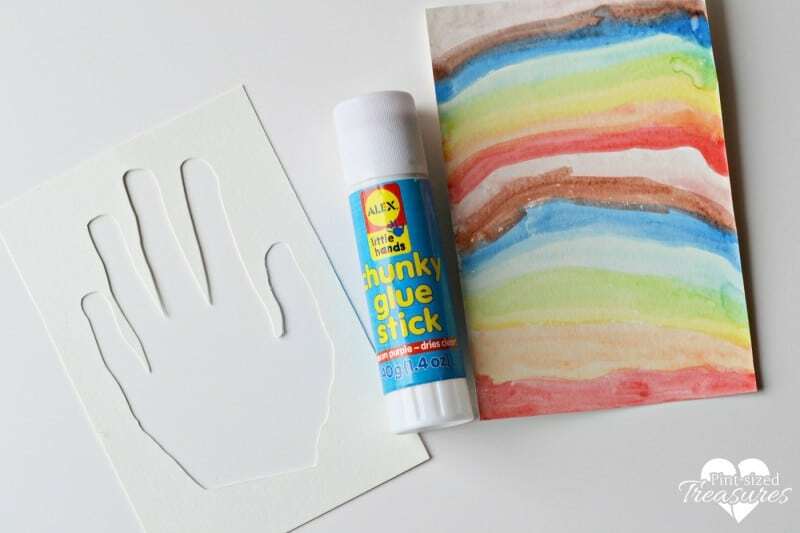 Here’s a hands-on, (pun intended) rainbow craft that your child is sure to enjoy! 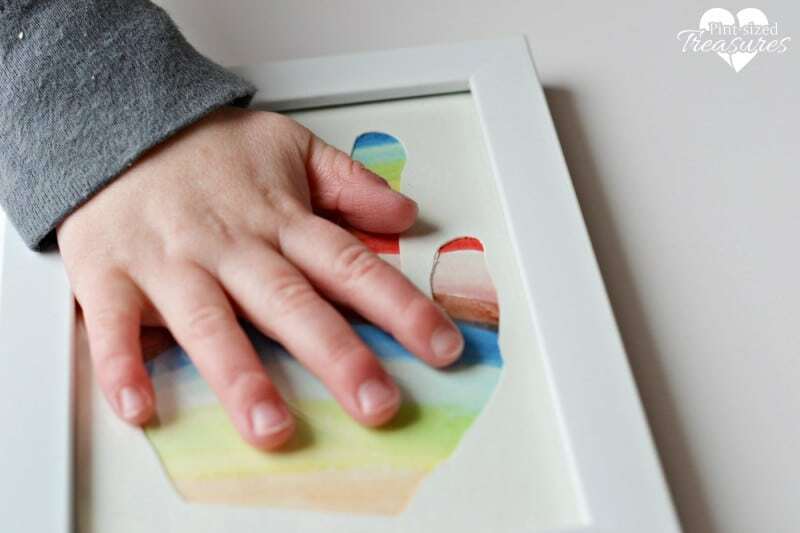 It’s Rainbow Handprint Silhouettes that you can frame, display, and even give as gifts. I’m sure you can think of family members and friends who cherish those little handprints too! 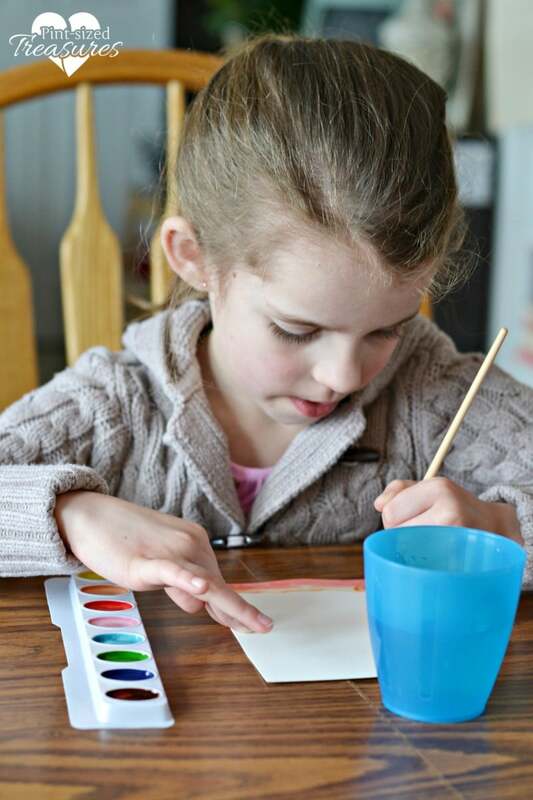 With just a few, simple supplies, you and your child can create a colorful piece of art that will preserve those little hands — just as they are now. OPTIONAL: If you want to do a little feet version, simply follow the same instructions, but trace the little feet instead! Who doesn’t LOVE little feet?! 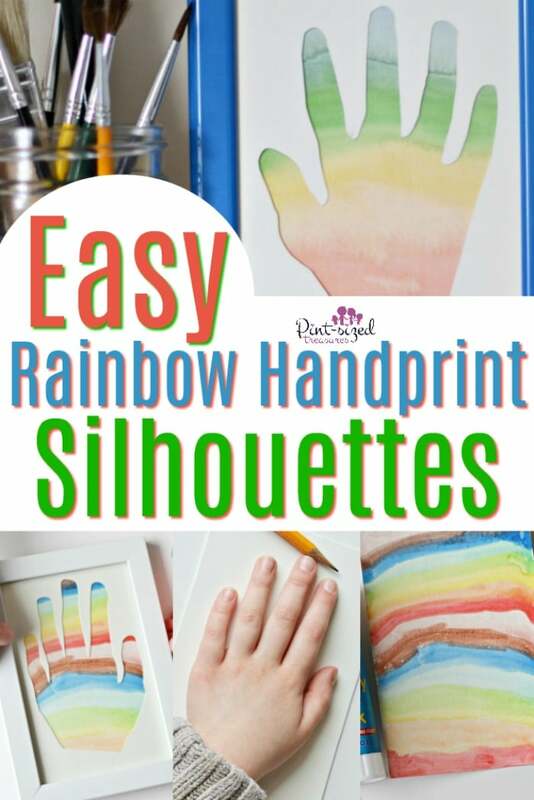 Ready to make your own Rainbow Handprint Silhouettes? Cut two pieces of watercolor paper the correct size for your picture frame. 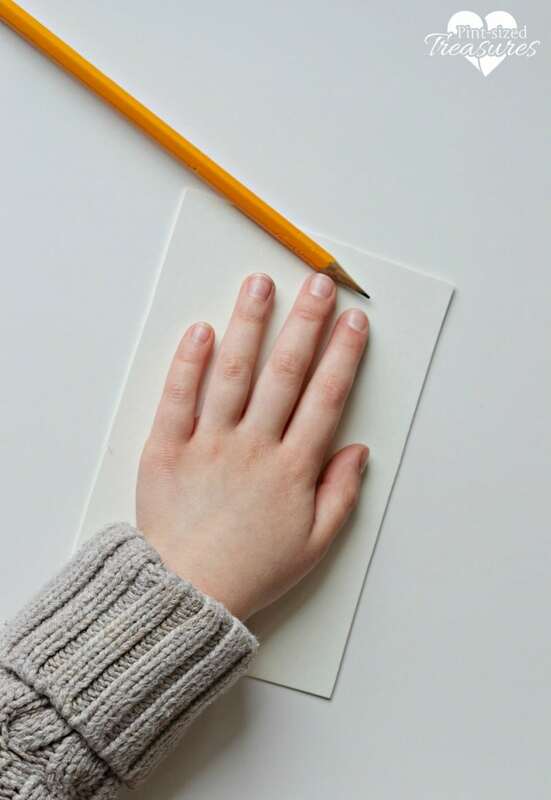 Trace your child’s handprint on one of the pieces of paper. Older children may love doing the tracing on their own. Prepare an area for your child to paint the second piece of paper to look like a rainbow. Lay out watercolor paint, brushes, a cup of water, and paper towels and let the painting begin! 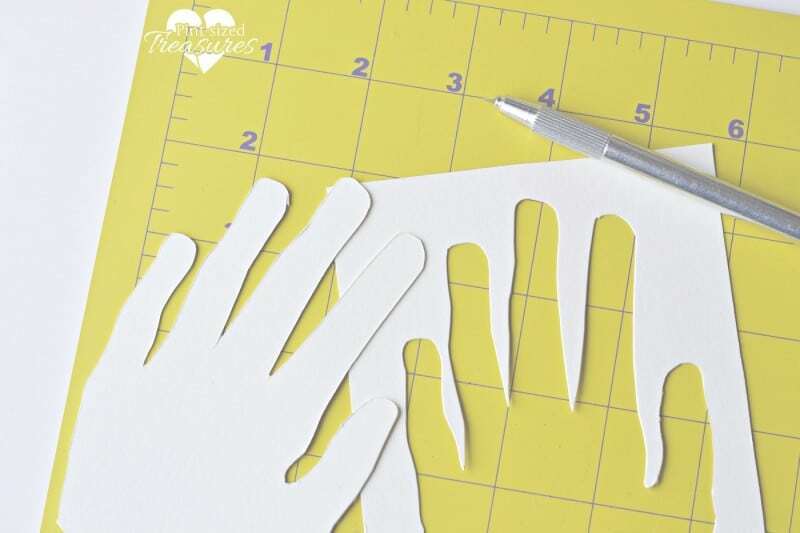 While they are painting their rainbow design, use a craft knife and cutting mat to cut out the traced image of their hand. This will serve as a mat for their rainbow artwork. Give the painting time to dry completely. Let your child glue the mat on top of their painting, allowing their masterpiece to peek through the portion that was cut out. Place the finished artwork inside the frame. 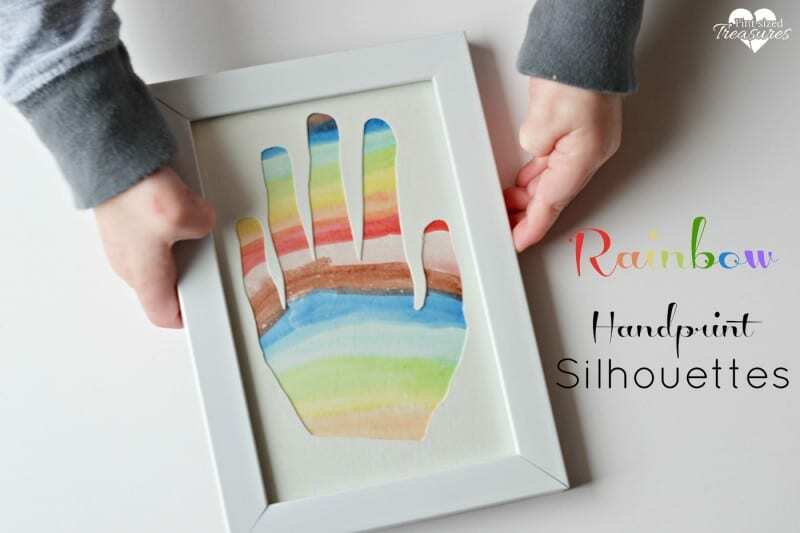 Display and gift the framed rainbow handprint silhouette. 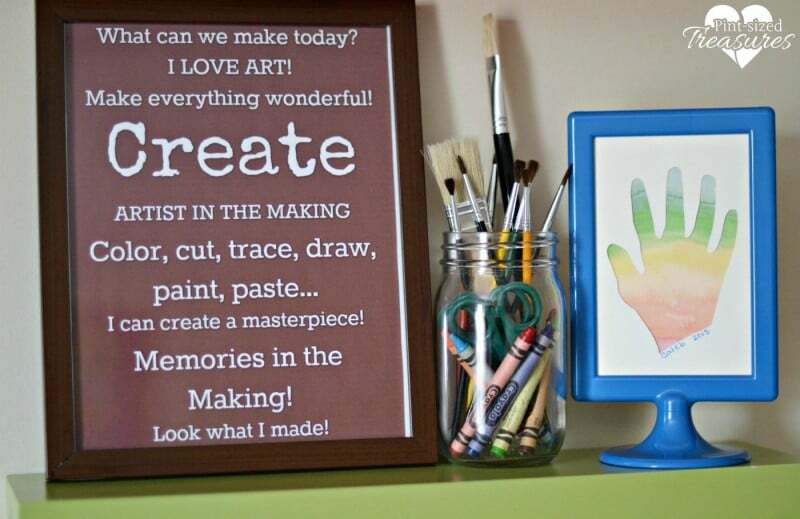 You can even display several of your child’s handprints in one collage with these frames. 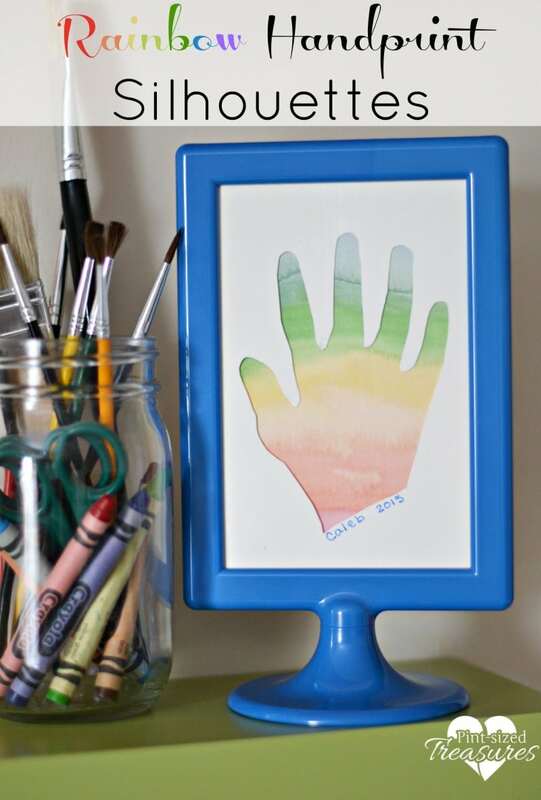 Whatever you choose to do with your rainbow handprint silhouettes, enjoy every moment of crafting with your child!